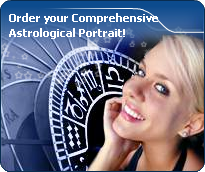 You will find below the horoscope of Anastasia Corlouër with her interactive chart, an excerpt of her astrological portrait and her planetary dominants. If you know the time of birth of Anastasia Corlouër, we would appreciate it if you would send us your information with your source, at stars@astrotheme.com. To thank you for contributing to the enhancement of our astrological database, we shall be glad to send you the astrological portrait (34 pages) of this celebrity. Horoscopes having the same aspect Sun square Pluto (orb 1°20'): Leonardo da Vinci, Jared Leto, Jessica Simpson, Taylor Lautner, Tobey Maguire, Liv Tyler, Priyanka Chopra, Ricky Martin, Jean Dujardin, Barbra Streisand, Renaud (singer), Jacques Brel... Find all the celebrities having this aspect. Horoscopes having the same aspect Venus conjunction Saturn (orb 1°22'): Donald Trump, Bill Gates, Benedict Cumberbatch, Marie Curie, Sathya Sai Baba, Dominique de Villepin, Javier Bardem, Mickey Rourke, Patrick Sébastien, Hilary Swank, James Spader, Rachel Bilson... Find all the celebrities having this aspect. Celebrities clicked on in real-time: 575,981,276 times. Anastasia Corlouër (formerly Anastasia Winnebroot), born on February 5, 1990 in Compiègne, is a French actress and beauty queen. She was Miss Picardie 2010. Here are some character traits from Anastasia Corlouër's birth chart. This description is far from being comprehensive but it can shed light on his/her personality, which is still interesting for professional astrologers or astrology lovers. In a matter of minutes, you can get at your email address your astrological portrait (approximately 32 pages), a much more comprehensive report than this portrait of Anastasia Corlouër. Warning: when the birth time is unknown, which is the case for Anastasia Corlouër, a few paragraphs become irrelevant; distributions in hemispheres and quadrants are meaningless, so are dominant houses and houses' accentuations. Therefore, some chapters are removed from this part. Like the majority of Earth signs, Anastasia Corlouër, you are efficient, concrete and not too emotional. What matters to you is what you see: you judge the tree by its fruits. Your ideas keep changing, words disappear, but actions and their consequences are visible and remain. Express your sensitivity, even if it means revealing your vulnerability. Emotions, energy and communication must not be neglected; concrete action is meaningless if it is not justified by your heart, your intellect or your enthusiasm. Cheers for communication and mobility, Anastasia Corlouër! The predominance of Air signs in your chart favours and amplifies your taste for relations and for all kinds of short trips, whether real (travels) or symbolic (new ideas, mind speculations). You gain in flexibility and adaptability what you lose in self-assertion or in pragmatism. Anastasia Corlouër, the Cardinal mode is dominant here and indicates a predisposition to action, and more exactly, to impulsion and to undertake: you are very keen to implement the plans you have in mind, to get things going and to create them. This is the most important aspect that inspires enthusiasm and adrenalin in you, without which you can grow weary rapidly. You are individualistic (maybe too much?) and assertive. You let others strengthen and improve the constructions which you built with fervour. After this paragraph about dominant planets, of Anastasia Corlouër, here are the character traits that you must read more carefully than the previous texts since they are very specific: the texts about dominant planets only give background information about the personality and remain quite general: they emphasize or, on the contrary, mitigate different particularities or facets of a personality. A human being is a complex whole and only bodies of texts can attempt to successfully figure out all the finer points. You need to concentrate on a subject, Anastasia Corlouër, to deepen your research and to follow your reasoning through with persistence and determination. You are the very type of the thinker who needs time and isolation to meditate at length and allow her serious, methodical and rigorous mind to show its worth. Your feet are firmly planted on the ground and to get your attention, ideas must be followed by implementation, for instance as in the case of mathematics applied to physics. You focus on the essential and you look at the world around you with clear-sightedness. You are not very talkative and you act with caution. You may come across as cold and ambitious even though your comments are always sincere and practical. However, be careful not to isolate yourself and to appear as a lofty and intolerant person. Anastasia Corlouër, it is obvious that you do not easily fall in love. But when you do, your feelings are deep, quiet, serious, and above all, lasting. Your need for security is indispensable for your well being and to enable you to give. You offer security and stability with your sense of duty even though you mix up responsibility and love. The charm of your partner does not only include physical features or aroused sentimental attraction, but also intellectual and moral qualities: you fiercely need authenticity and seriousness because this is the way you are. In general, your loves are not numerous and you become able to express yourself quite late in life. Your quiet and stable feelings are really worth it. If you do not get what you want, the danger is that you may seek refuge in cynicism and that you isolate yourself. Anastasia Corlouër, you are so resistant and so solid that you are able to cope with any challenge, any ordeal. You behave with persistence, rigour and discipline. You are so obstinate and patient that no effort is impossible to you, as if sensitivity and emotions were unable to divert you from your goals. With calm and lucidity, even coldness, you face up to things and you plan on a long-term basis. Nothing and no one can prevent you from fulfilling your responsibilities. You are a rock, a hard worker, and your iron will equals your resistance to blows. Your practical sense is at the service of your ambition which is real and energetic, even though it may not be obvious. Sexually, you are active and vigorous. If you show more warmth, you may become an excellent lover; indeed, being demonstrative is not your major concern. This text is only an excerpt from of Anastasia Corlouër's portrait. We hope that it will arouse your curiosity, and that it will prompt you to deepen your knowledge of astrology, as well as to visit and use the wide range of free applications at www.astrotheme.com. Your Life Path is influenced by the number 8, Anastasia, which indicates that your destiny hinges on financial successes, material undertakings, and power seizing. It is a path full of successes and failures, fortune and reversals of fortune. You must strive to control your thirst for material goods, and try to practice tolerance. Great achievements are possible if you choose a career in any sort of trade or business. This is how your qualities are likely to be best expressed: management abilities and above-average commercial sense. Traditionally, the number 8 is believed to favour material and financial matters such as asset management, investments, commercial negotiations, as well as social power. All these elements are most likely to be found at the centre of your life. Your thirst for power, added to some degree of bad luck, constitutes one of the major hurdles blocking your way. However, your determination, added to a deep spirit of conciliation, turns the number 8 into a very fulfilling one, that of extraordinary successes.